Secunia has released a new service called Software Inspector to inspect your operating system and software for insecure versions and missing security updates. A default inspection normally lasts 5-40 seconds, while a thorough inspection may take several minutes. One way to keep your system safe is to have the updated version of each application which (normally and ideally) is more stable and less bug than previous version. This service uses Java (i guess) and the only thing you have to do is to click on the Run button and it will start scanning your computer and verifying it whether it has the latest version or have all the patches installed or not. If you have slow Internet connection, please don't use the thorough scanning as it will scan almost everything in your computer and i guess it will take much much longer than normal scanning. Also it will increase your system's load, so do it at night or at morning. So far, i only test this application in Windows and i haven't tested it yet in Linux operating system. I hope they made this application portable to be executed under every platform available. If any of you have tested this service on Linux and it's working, please let me know and i will test my system also. NBA and YouTube are planning to have a cooperation between them. NBA agreed to share a limited amount of proprietary game and behind-the-scenes video footage to YouTube, while for YouTube, it will encourage fans to upload NBA movies on their site. The release of Blender 2.43 resemble seven months of development time from the Open Source community which bring significant improvements over previous version of Blender. The detailed new feature available on Blender can be seen on this Release Notes while more features in 2.43 can be seen in More 2.43 feature page. 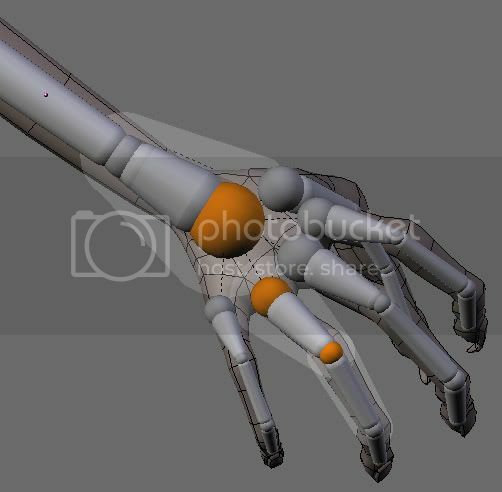 You can see the features of Blender here. I think this version is ready for daily production use by many modeler around the world to create sophisticated design and visualized model. Blender is the free open source 3D content creation suite, available for all major operating systems under the GNU General Public License. It supports Windows, Mac OS X, Linux, FreeBSD, SGI Irix, and Sun Solaris. I tried this search engine by trying to find a code snippet for Random and the query returns with 206958 matching files. Surely it will took a while to decide which code i should use, but it's worthed rather than having to implement new code for something which has been implemented by other people. When you want to have a similar function as the other, why bother to reinvent the wheel? It's more efficient to use other's work (don't forget to include the author's name as a credit) and surely it's not wasting time to code again. This morning i got an email message from Sandip Maiti, one of the founder of Zimoz, a site which offer a concept of postcard, where you can make your own postcards and send it to your friends around the world (they called it a format free creation tool that would be super easy to use for everyone to express stories, issues and trivia). The process of making the postcard is very attractive and interesting, as you can put any kind of information (text, video, pictures, banner, cliparts) on the postcards and use the drag n drop like in other Web 2.0 enabled site. Microsoft said that the minimum requirement to run Windows XP are CPU with 233 MHz an 64 MB of RAM, but some people in Germany had tried to beat that official requirement by trying to install and run Windows XP in the most minimum specification and they made it even though it's very time consuming (but they deserve to receive the The golden Sandclock Award For extreme waste of time for their efforts). PC World has conducted a review of five blogging platforms (Blogger, WordPress, TypePad, Tripod, and SquareSpace) and the winner of this review is Blogger from Google (91 out of 100). You can see the brief summary here or if you prefer to see the detailed comparison, please visit this URL. One thing i realize after i saw this chart is that Blogger gives limitation on the images we uploaded to the Blogger up to 300 MB (after i browsed the Blogger Help because i didn't find this kind of information at the front page of Blogger). So, i guess it's better to put your images in other free services such as PhotoBucket which gives you about 1 GB of free storage of video/image (or any other free services that you prefer. I choose Photobucket because i use them). Number of Blogs: You can have as many blogs as you like on one account. Number of Posts: There is no limit on the number of posts you can have on one blog. They will all be saved on your account (unless you manually delete them) regardless of whether you are publishing archives or not. Size of Pages: Individual pages (the main page of your blog, or your archive pages) are limited to 1 MB in size. This will allow for a few hundred pages of text, but it may be a problem if you are listing hundreds of posts on the front page of your blog. If you hit this limit, you will see an error message saying "006 Please contact Blogger Support." You can get around this error by lowering the number of posts on your main page, which will have the added benefit of making your page load faster as well. Number of Comments: A post can have any number of comments. As with archived posts, if you choose to hide comments on your blog, all pre-existing comments will remain saved on your account. Number of Pictures: If you are posting pictures through Blogger, Picasa, or Hello to a free BlogSpot blog, there is a total limit of 300 MB. If you are posting them to an FTP-published blog, then you are limited to the amount of space available on your server. Team Members: There is no limit on the number of members or administrators per blog. Blog Description: Limited to 500 characters, with no HTML. Adding additional characters or HTML may cause it to revert to a previous setting. "About Me" Profile Information: Maximum of 1200 characters. Profile Interests and Favorites: Maximum of 20 items each, 60 characters per item. After one day delay, finally Firefox 2.0.0.2 has been released by Mozilla Team and it's going to be available on your Firefox updates (usually it will download the updates silently and when you start Firefox in the future or when you close and re-open Firefox, it will prompt you to install the updates). # Security Update: The following list of security issues have been fixed. # Windows Vista Support: Many enhancements and fixes for Windows Vista are included along with the following caveats. # New Languages: Beta releases for several new languages are now available for testing. # Permissions Bug Fixed: In the German (de) locale on Windows and Linux, resolved a problem with certain files tagged as read-only. Full detail on what's new can be seen in Firefox's Release Note. I used Fren from Mobile-8 to communicate with my girlfriend in Jogja. She also used Fren so we can communicate with each other with cheap prize. But suddenly after the price was raised, everything became way too expensive. I usually buy 1 voucher for 1 month, but this month i already bought two voucher even though i used the same frequency to call my girlfriend (furthermore, sometimes she is the one who called me). My colleagues and friends also feels the same thing, because they said that their credit (for pre-paid type) are dropping so fast and when they realized it, it's already almost empty. Other problems that i usually experienced when using Fren is the limitation of the networks. When you try to make a phone call around 8 - 10 PM, you will often receive a busy line message from the operator thus you will have to redial again and again before your call can be received by the recipient. Also sometimes i had a dropped call in the middle of the conversation, even though the signal is full. I was writing that Mozilla Firefox 2.0.2 will be out this week and the release date was scheduled to be 21 February if no major problem, mostly regarding to security, but unfortunately, there is. ComputerWorld has wrote an article about postponed Firefox updates due to a security vulnerability related to cookies that was found by Michal Zalewski. He also had some online demo to check whether your browser is vulnerable or not. Here's the full disclosure about the issue. The good news is that Firefox team had already made a patch to fix this issue, but they will need some time to re-test all of them and make sure that there aren't any regression made by this patch. They plan to shift the release date for one day and to be scheduled to be released on February 22. That's one thing i like about Open Source, the patches are ready in short time and not taking a lot of time before the customer can have them. I was going to read The World Is Flat after i finished reading other novel which i bought in Taman Anggrek Mall when i bought a valentine gift for my girlfriend, but it was postponed again. My girlfriend bought me two novels about Artemis Fowl and she sent it along with other stuffs and few days ago when i went to my aunt's house to celebrate Chinnesse New Year, my sister told me that she had the first novel about Artemis Fowl so i borrowed it and i read it. Actually, Artemis Fowl has 5 books, but i only have read 3 of them so far (Artemis Fowl, The Arctic Incident, and The Eternity Code). The other two are The Opal Deception and the latest book The Lost Colony. I am also waiting for the next Harry Potter from J.K. Rowling (scheduled to be released on July, 21th) and also planning to buy the next book from Philip Pullman, The Subtle Knife and The Amber Spyglass as i already have the first one, Golden Compass. I just viewed OOo 2.2.0 RC1's Changelog and see interesting entry there (which i guess for other Slackware users around the world). After doing integration with some other Linux distribution (like Mandriva, SuSE, Debian, and RedHat), finally OOo integrate themselves with Slackware distribution (even though there's a long debate on this Issue 59183) due to several reason (please have a look if you are interested). If you want to see full detail of the changelog, please see the Release Note of OOo 2.2.0 RC1. Today we (me, my sister, my aunt and his wife and my cousin's family) went to Senayan City to have dinner together. It's our common tradition to have dinner together with all of the family on some special events, such as christmas and sometimes during the chinnesse new year celebration which will be celebrated tommorrow. It's my second visit to Senayan City and it seems that almost all of the shops were already start operating with only few of them which still under construction. It's totally different compared to the first time i went there where most of the shops were still not operating. The restaurant were very crowded because many people went there also (also in some other restaurant for example, Duck King and also Sushi Tei), but luckily we have reserved the place yesterday, so they already prepared the table for us. After a while, we started to order and we saw in the menu that it's quite expensive (perhaps because of chinnesse new year, i don't know), but the portion was quite big, so it's worthed with the price but too bad we were wrong. After the first menu was served, we finally found out the portion was so small. While we were eating, we saw some kind of offering from Citibank for those who had a Citibank credit card. If you have those card, then you have a chance to get 25% off, 50% off, or even 100% off (means you don't have to pay anything). One of us had a Citibank credit card and my cousin take the dip and we got the Free dinner prize. We were quite surprised because we thought that it's very hard to get that chance, but we got it, so we didn't have to pay anything for the dinner. Later on, i found out that most of the restaurant on that floor had the same offering from Citibank. I guess this had to do with Citibank's promotion in order to attract people to use their credit card. So if you have Citibank's credit card, why don't you try your luck in Senayan City? Perhaps you can have a free one like what i had today. One of my must-have extension for Firefox is Web Developer from Chris Pederick. It has lots of options which is quite useful when you are building a web application. You can simulate a screen view in other resolution, view almost all kind of information during the development of the web pages, such as table information, table borders, images, CSS, Forms, and many more. I recommend this extension if you are a web developers or someone who love to make web application. Click here if you want to install Web Developer for Mozilla Firefox/Flock or here if you want to install it on Mozilla/Seamonkey. It's not the only extension i recommend, since there are a lot of them, but in my personal opinion, this is my #1 extension. I sent a package to my girlfriend on February 13th noon and i was hoping that it will reached the destination at 14 of February as it was my gift for her. I took the ONS (One Night Service), so i was quite sure that it will reach Jogja on time, but i was wrong. At 10 AM, i called my girlfriend and asked her whether the package has arrived or not, and she confirmed that no package has been received up to now, so i tried to track my package via Tiki's website, but it came up empty. So i called their customer service and they said that they had some problems on the online tracking, so they tried to do it manually and i got an information that the package was already in Jogja since it has left Jakarta since morning (6 AM) and it's on the way to the recipient. At 4 PM i called my girlfriend again and asked her again, but still no package received, so i called Tiki again since it supposed to be arrived at that day, but they couldn't give a precise answer since they didn't get the confirmation from Tiki in Jogja, so they asked me to call again today if the package hasn't arrived. So at 8 AM i called the customer service again and i asked them to get a confirmation from Tiki in Jogja about my delivery and she would call me back after she got an information, but not long after i hung up the phone, my girlfriend sent me a SMS message saying that she already got the package. Phewww. The package was delivered, but somehow it took more time than i expected. Perhaps it's because there were so many packages being delivered at that time (it's Valentine day), so they slipped my package. Perhaps in the future i should send them 2 days before, just for anticipation. Firefox 2.0.2 is scheduled to be released next week (21st of February) and if there isn't any big problems, it will be one of the must-have updates of this month, since it fixed so far ~152 in total, ~21 crashers, 2 memory leaks, 34 regressions and 4 privacy-related bugs according to MozillaZine and it will keep fixing bugs until the final version is ready for public consumption. anybody else wants to add new application that is scheduled to be released this month? For several months, Indonesian Linux Forum has been freed from Spammers after the last incident back in October 2006 when the spammers post about 1600-1800 post before finally they were deleted directly from the database and put more protection on it. But recently, there were a few spammers who can break through the CAPTCHA protection provided by phpBB. I don't know whether they are human or not, but they managed to register it successfully and start sending a 'polite' spam just like what hit Alex's blog and then after few days, they changed their post to their real message (spams) and selling common things that usually being sold by spammers, such as Viagra or Pills/Drugs. Actually i already kindda suspicious when they posted one message on the forum, but since it's not related to any spam, i just ignored them, and several days later, they changed them and my instinct was correct. They were spammers. Even though it's not as bad as what we had in 2006, it's very annoying and more task to do (deleting post, users, and perhaps banning them). Actually there's an option in the phpBB Administration Panel to configure the registration method whether it will be via email (user has to confirm via email sent by phpBB) or via admin (admin have to approve before the user is activated). Usually, most phpBB installation will use email as the preferred method, since the administrator does not have to confirm each time there's a new user registered, but it's also prone to spammers, as most spammers can try to simulate the registration process and reply the email sent to the email address. In order to prevent spams, it's possible to change that method to admin, but do we have time to acknowledge all request that's coming to us? Currently, i don't have that, so i didn't activate that methods for now, but when the spammers are hitting us again in the future and i do have that time, perhaps we can activate that kind of protection. I may have to ask Ronny Haryanto first before activating this method as i'm only helping him maintaining the forum. We notice you're not using Internet Explorer. To continue, please visit this page using Internet Explorer 6.0 or later. Get the latest version for your computer. I also have problem viewing my transaction inquiry on my bank using web access. It seems that the bank also requires IE as the browser or some functions will not be available (even the logout button is not enabled when viewing the site using non-IE browser). This document specifies the design goals and requirements for a specification that would standardize the way client-side web applications (widgets) are to be scripted, digitally signed, secured, packaged and deployed in a way that is device independent. The type of web applications that are addressed by this document are usually small client-side applications for displaying and updating remote data, packaged in a way to allow a single download and installation on a client machine. The application may execute outside of the typical web browser interface. Examples include clocks, stock tickers, currency converters, news readers, games and weather forecasters. Some existing industry solutions go by the names "widgets", "gadgets" or "modules". As you know, Widgets has become more common these days, as Microsoft also supports widgets in their latest operating system, Windows Vista. Yahoo have also created Yahoo Widgets (i have tried this application before), and others have followed also. Therefore, it's a good idea to make some kind of standard specification about how the Widgets should be implemented in order to have higher level of interoperability and device independency. OOo fans, get ready to receive gift from OpenOffice.org Team by the end of this month, as they scheduled to release OpenOffice.org 2.2 on February 27 (it's not a fixed date, but if there aren't any major problems, it will be released in this date). OOo 2.2.0 will bring stability and some new features compared to OOo 2.1. OOo Team has also scheduled to release an update to 2.2.x version (which will be 2.2.1) on May/June that should fixed only the important bugfixes that occured on 2.2.x version. For regular defects, it should be fixed in OOo 2.3, as OOo 2.2.x development has been freezed since January 25. For more details schedule, please have a look on OOo Product Schedule. 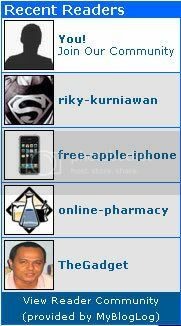 When i opened my blog, i saw an entry on myBlogLog that is quite interesting, free-apple-iphone and online-pharmacy (see screenshots below). When i browse Eris' site, i also the same entry with the same sequence. Is it just a coinsidence? How about your blog (of couse who turned on their BlogLog account)? Do you see the same account accessing your blog? Sometimes, we do something without thinking about it deeply at the beginning. At the end, we don't get the result we expected and sometime there's nothing we can do to fix it, because we can't rollback the time (not like Transaction in Database which can be rolled back). Therefore, it's a wise thing if we think about our next action before doing something, mostly for important task. "Sekarang rakyat sudah mulai menjarah akibat penanganan banjir yang tidak baik. Untuk itu kami mengimbau kepada seluruh rakyat yang terkena bencana banjir untuk segera menjarah apotik-apotik, toko-toko makanan seperti Carrefour, Hero, Indomaret, dll." "Now people have started to rob due to bad flood handling. Therefore, we advice to all people who suffered from the flood to start robbing drug store, groceries such as Carrefour, Hero, Indomaret, etc." When he was arrested, he said that his motif was to make other people scared and start carrying to other people and help them, but i don't think this is relevant with his message. He suggest other people to do bad things (stealing). If he really tried to help other people, why would he had to do that? Is that a good way to help other people? When i woke up today, i noticed it was raining hard and when i saw outside, the water has reached the sideway of the road, thus i couldn't go to the office without breaking the water and for that, i have to bring substitute clothes, so i decided to wait for a moment, since it's 6:30 in the morning, so i still had a lot of time to wait before i can go to the office. Besides, i can reach my office in less than 5 minutes on foot, so i just laying in the bed while waiting until the water has sunk. I guess some people will be unable to go to their office today, due to the raising water in some places and this uncertain condition will last until the rainy season has ended. Finally the D4ALL (Design 4 All) version of OWG Project has been officially released for public. You can grab them at OWG's official site. For now, it's only available on Dutch language (officially), and i don't know when will it be available (because we haven't receive any request to build the English version up to now), but our team had already make the unofficial English version and conducting some internal testing, because we removed some components that belongs to OWG and use other components that can be used legally. One of the biggest change is the TTS engine. In the unofficial English version, we tried to use Microsoft's Speech Engine SDK which can be downloaded from Microsoft's site. At first, i was quite confused about the decision of which TTS engine should be used, because we are looking for something which is good enough and if possible free. We tried several TTS engine before finally we decided to use Microsoft's Speech engine. Actually since Windows 2000, Microsoft has shipped a default speech database (it's either Mike/Sam i forgot), but it's not that good, so after you install Speech Engine SDK, you will get 2 additional sound database and it's quite good. Unfortunately, Microsoft hasn't implemented Spell method in their Speech engine, so in order to simulate the spelling process, i have to make my own implementation of Spell() which is available on the original TTS engine being used in the D4ALL version and the result is nice. Berapapun besar bantuan rekan-rekan, pasti akan sangat membantu para korban banjir di Jakarta. Penggalangan bantuan ini kami buka selama 1 minggu, mulai tanggal 6 – 13 Februari 2007. Dana yang terkumpul akan kami utamakan untuk pengadaan obatan-obatan, terutama paska air surut, seperti karbol, minyak angin, obat diare dan lain-lain. Dan akan kami salurkan pada kelompok – kelompok yang membutuhkan. 2. Urban Poor Linkage Indonesia (UPLINK) yang mempunyai akses pada warga miskin di wilayah-wilayah berikut ; Jakarta Timur ( Bantaran sungai Cipinang Besar Selatan, Prumpung, Pulogadung), Jakarta Utara ( Semper, Kolong Tol Warakas, Kolong Tol Sungai Bambu, Pademangan, Teluk Gong), Jakarta Barat ( Blok Asin, Pekojan, Rawa Buaya). UPLINK sendiri memiliki posko di Komplek Billymoon Blok H1/7 Pondok Kelapa, Jakarta Timur. Telpon (021) 8642915, 86902407. Setelah lewat satu minggu penggalangan dana, kami akan memberikan pertanggungjawaban publik via mailing list maupun situs, tidak lebih dari 20 Februari 2007. Terima kasih atas atensi dan bantuan rekan-rekan sekalian. Khusus mereka yang transfer dana ke rekening BCA, harap konfirmasi ke Meij Nie atau Bayu via telepon 021-5260758, fax : 021-5260790 atau info@wikimu.com. Bila ada pertanyaan atau ingin keterangan lebih jauh, silakan hubungi saluran yang sama. I spent one full day at home at Sunday, because the Internet at my office was down (i called the customer service and they told me that it will take few days to repair the system as they had to change all the hardware, but i just heard from TV that the Internet connection has been restored and up again at night). I took this chance to finish reading Golden Compass and finally i did. Last night, i finally finished reading this novel and i started reading another book, The World is Flat which i got from Wikimu last month. PHPMyAdmin has released their beta1 version for the upcoming 2.10.0 version and this version will include some new features, such as calendar (in Search page) and also graphical relation manager. One thing i like is this new beta version is speed improvement on big database/tables. Gaining faster access while querying or manipulating records on the database can also improve our productivity (mostly if we work with long and complex SQL queries every day).